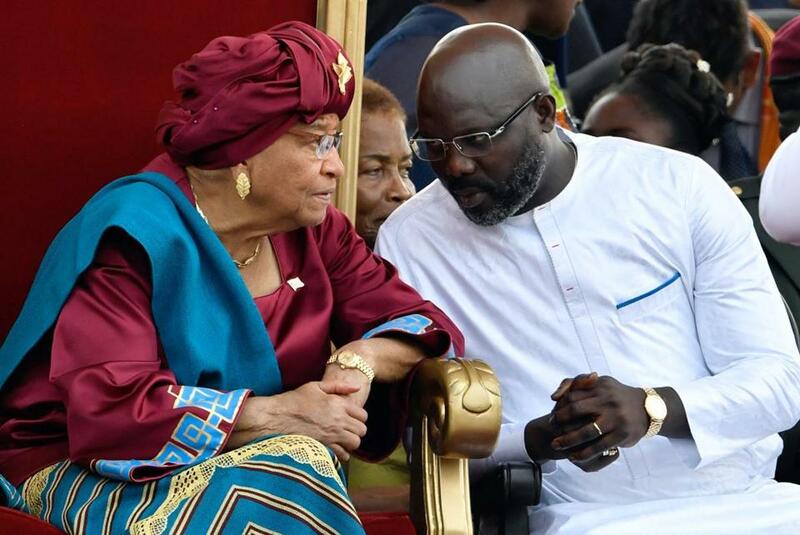 George Weah, shown with outgoing president Ellen Johnson Sirleaf, vowed to end political corrution in Liberia. MONROVIA, Liberia — Former international soccer star George Weah was sworn in as Liberia’s new president Monday, taking over the impoverished West African nation from Africa’s first female leader. The 51-year-old, who was FIFA’s 1995 player of the year, took the oath of office to cheers from tens of thousands of Liberians. Weah inherits a weak economy along with poor health and educational sectors. ‘‘I do not promise you quick fixes or miracles. Instead my pledge to you today is that my administration, with your help, will make steady and deliberate progress toward achieving the hopes and aspirations that you cherish in your heart for Mama Liberia,’’ he said.